Human Rights Progress In North Korea: Is It Possible? Despite hopes, even predictions that Kim Jong Il’s death might usher in progress on human rights in North Korea, no change is yet discernible. North Korean defectors have long speculated that Kim Jong Un would not enjoy the same lockstep support commanded by his father and grandfather and might have to respond in some measure to popular needs and aspirations. The North Korean economy, moreover, might not survive without reform. Even though the government periodically clamps down on private market activity, the people, including some in the government, are increasingly showing themselves to be of a “market mentality.” Since they will not easily relinquish this reliance, it could pave the way toward greater economic freedom and ultimately political reform. New information technology is further eroding the isolation imposed by the regime. Is this wishful thinking? Even assuming Kim Jong Un were inclined to promote change (a very big unknown), could he do it? He is surrounded by his father’s advisers and hard line repression continues while he consolidates his authority. As one expert put it, Kim Jong Un will not be able “to depart from his father’s legacy until he has fully established himself as the new ruler.” But “the longer he spends strengthening his position based on the same system of brutal repression, the less of a chance he will have to break away.” Arrests and purges have accompanied his ascension to power, reinforced by the support of those in the military, party and elite who stand to benefit from the regime’s continuation. Tacit support has been given to Kim Jong Un by the international community. Wary of North Korea’s nuclear arsenal and aggressive stance toward the South, and fearful of possible refugee flows and instability, China, the United States and other countries have made ‘stability’ their principal objective. However, in the process of doing so, they have largely sidelined the equally compelling need for justice and human rights. Of course, unexpected changes can take place in countries deemed unlikely for human rights reform. They may arise less from external pressure than from the ripening of conditions inside the country toward openness and change. Or they may arise from governmental steps to institute reforms to ensure the regime’s survival and secure international aid. In the latter case, North Korea’s surprise announcement of a satellite launch in April appears for the moment to be scuttling prospects for international assistance from the US and other countries and ushering in a period in which prospects for human rights reform look dim. Nonetheless, it is important to identify the signs to look for when trying to gauge whether Pyongyang’s new leaders are ready to head in new directions. Following are benchmarks that could serve, singly or together, to suggest the onset of possible change in North Korea’s policies. They are not in order of directly saving lives. They begin with North Korea’s obligations and relationships at the United Nations, because the UN is the sole multilateral forum, of which North Korea is a member, that reviews, discusses and publishes reports on the country’s human rights record. North Korea’s new government therefore has to decide whether it will collaborate with the UN. In 2009, North Korea indicated that if certain (unspecified) conditions were met, it might enter into a dialogue. Some speculate the “conditions” might include ending UN member states’ resolutions on North Korea’s human rights record. The member states involved, however, may be unwilling to forego their longstanding resolutions in exchange for a dialogue with the High Commissioner that could prove unproductive. They may also object to conditions being placed on a dialogue. The High Commissioner on the other hand, has been weighing the idea of negotiating conditions with North Korea for gaining access. No. 2: Will North Korea invite for a visit the UN Special Rapporteur on human rights in the DPRK? The position of Special Rapporteur on the situation of human rights in the DPRK was created in 2004 “to investigate and report” on the human rights situation and make “direct contact” with the North Korean government, “including through visits.” North Korea rejected this program from the beginning as “a political plot” intended to “change the ideology and system of our country,” and it has never invited the rapporteur to visit. In fact it is the only country in the world where a UN special rapporteur on a specific country has never been allowed to visit or have a dialogue with the government. In 2010, Marzuki Darusman, a former Indonesian attorney general, succeeded Vitit Muntarbhorn of Thailand as Special Rapporteur. He was selected in part because his government had friendly relations with North Korea, and it was thought this could lead to an invitation. But to date, it has not. Were North Korea’s new leaders to extend one, it would be a total turnabout in its position and signal a readiness to open up the country to human rights scrutiny. UN Special Rapporteurs are known to insist on unhindered access and to produce strong human rights reports on countries. No. 3: Will North Korea agree to implement any of the recommendations made at the UN’s Universal Periodic Review (UPR)? The UPR, conducted by the UN Human Rights Council, reviews the human rights records of all UN member states every four years. North Korea’s first UPR took place in 2009-10; it agreed to participate and sent a high level delegation. Member states made 167 recommendations to its government for improving its practices. It rejected 50 out of hand (among these a moratorium on executions, ending the collective punishment of families, stopping forced labor, decriminalizing freedom of movement, and setting a time frame for resolving the abduction issue). But it separated out 117 recommendations that it said it would “examine.” These included: setting up a national human rights commission (proposed by the United States), ratifying treaties on child labor and disabilities, ensuring implementation of the Convention on the Rights of the Child, accepting labor standards for workers, joining the International Labor Organization (ILO), facilitating family reunions, providing human rights education to its citizens, allowing technical assistance from the High Commissioner, granting ICRC access to detention facilities and providing greater access to international organizations distributing food. But in the end, it did not identify a single recommendation it would carry out even though its Ambassador said it “accepted” some. In 2011, the General Assembly expressed “serious concern” at North Korea’s “continued refusal” to identify the recommendations that enjoyed its support. Initially North Korea said it would cooperate with the UPR because the process applied to all countries, not just North Korea. Its failure to do so has subjected it to a great deal of international criticism. Were anyone inside the regime ready to see benefits accruing from cooperation, and North Korea were to begin to inch in that direction, technical assistance could be provided. Setting up a national human rights commission, for example, should meet UN criteria for such bodies. And ratification of treaties should be accompanied by steps to bring laws and practices into line with international standards. No. 4: Will North Korea provide information to other human rights bodies? North Korea has acceded to four human rights treaties (the International Covenant on Civil and Political Rights, the International Covenant on Economic, Social and Cultural Rights, the Convention of the Elimination of All Forms of Discrimination against Women, and the Convention on the Rights of the Child) and is required to report to expert bodies set up under these treaties to monitor compliance with them. For the most part, North Korea has reported inadequately and tardily. It has, however, made reports, albeit brief, to the Committee on the Rights of the Child, but has failed to submit its report, due in 2004, on compliance with the civil and political rights covenant. UN expert bodies also regularly request information from North Korea about individual cases of prisoners and abductees. These bodies include the Working Group on Enforced or Involuntary Disappearances (which has nine North Korean cases on its agenda), the Working Group on Arbitrary Detention, and the Special Rapporteurs on torture and on extrajudicial, summary or arbitrary executions. Were North Korea to begin to cooperate with these bodies, it would signal a readiness to admit that it is holding political prisoners and that it is ready to consider improving their conditions. No. 5: Will North Korea amnesty political prisoners and make information available about those released? Following Kim Jong Un’s accession to power, North Korea on January 29 announced an amnesty for prisoners, its first in over four years. North Korea did not, however, make known whether any of those released were political prisoners. It also has not made public lists of the prisoners released or those still held, the ‘offenses’ for which they are imprisoned, the terms of their imprisonment and the camps in which they were incarcerated. Were North Korea to begin to issue public lists with information, it would be a sign that it is ready to lift some of the secrecy surrounding those incarcerated for political reasons. Often referred to as “those who are sent to the mountains,” public lists of prisoners would bring their cases to light and enable people inside and outside the country to know where they are held and whether or not they have been released. The next amnesty is expected April 15 on Kim Il Sung’s centenary. It should be emphasized that for many decades, North Korean prisoners were ‘nameless and faceless’ to the outside world. However, with 23,000 defectors now in the South, including hundreds of former prisoners and also some prison guards, case histories of actual people are increasingly coming to the fore. One such is the family of South Korean economist Oh Kil Nam. Lured from Germany to the North in 1985, he was ordered by Pyongyang to recruit more South Koreans from Europe. Instead, once back in Europe, he applied for political asylum. To punish him and isolate his family, North Korea put his wife (Shin Suk Ja) and two young daughters (Hye Won and Gyu Won, aged nine and eleven) in a penal labor camp. This was in line with the Kim regime’s long practice of imprisoning ‘up to three generations of families’ (or ‘guilt by association’). Were North Korea to respond to the growing campaign for the release of Oh Kil Nam’s family, or others like him, it would signal a willingness to make concessions to the outside world. North Korea’s new leaders might calculate that it could benefit the country politically or even economically. Burma’s recent release of political prisoners has opened the door for dialogue with the international community, visits by senior foreign officials, an upgrading of relations with the US and a loosening of restrictions on economic aid. In the case of North Korea, the release of the Oh Kil Nam family and others similarly incarcerated might signal willingness to reduce or end the criminal practice of imprisoning entire families, a practice widely denounced internationally. Halting the practice could help North Korea with any future quest for international acceptance and legitimacy. No. 6: Will North Korea allow the International Committee of the Red Cross (ICRC), the World Food Program (WFP) or UNICEF into the penal labor camps? North Korea is reported to hold up to 200,000 political prisoners. Because of the high number of deaths reported in detention, human rights groups have increasingly begun to recommend that humanitarian organizations like the ICRC, WFP and UNICEF be allowed entry into the camps. The US State Department’s 2010 human rights report affirmed, “Many prisoners in political prison camps were not expected to survive.” Reports of starvation rations, lack of medical attention, torture and ill-treatment of prisoners, executions, forced labor, and incarceration of children have been reported by former inmates and former prison guards who have made their way to the South. Allowing international agencies access to the camps to provide food and medical care for prisoners would be a major step toward ending their isolation and reducing the high death rate. Access by outside organizations might also signal the beginning of the dismantlement of camps long associated with the rule of Kim Jong Un’s father and grandfather. No. 7: Will North Korea agree to release more abducted foreigners and give a full accounting of those held? In 2002, North Korea admitted for the first time that it had abducted foreigners to make use of their linguistic or other skills or steal their identities. Kim Jong Il formally apologized to Japanese Prime Minster Junichiro Koizumi, and North Korea then allowed five surviving abductees plus a few family members (held for more than 20 years) to return to Japan. However, it did not give satisfactory information about 12 other abductees and sent the remains of two persons whose DNA did not match the victims. North Korea is also reported to hold South Koreans (going back to the time of the Korean War), foreigners from Europe, Asia and the Middle East, and most recently ethnic Korean Chinese (abducted because of the help they provided to North Korean refugees in China). It could begin to mitigate some of the international opprobrium it has engendered because of these abductions by providing a full accounting of those kidnapped, returning all remains, allowing all victims to leave, and offering compensation. Doubtless it would gain political and economic concessions for doing so. Both the Japanese and South Korean governments are prepared to negotiate. No. 8: Will North Koreans continue to suffer severe punishment for leaving their country without permission? For some 15 years, and especially in the last five, North Koreans leaving their country without permission have been subject to extremely harsh punishment—beatings, torture, forced labor, imprisonment, execution, and in the case of pregnant women, forced abortions and infanticide. UN Secretary-General Ban Ki Moon has called North Korea’s criminalization of the right to freedom of movement a “clear violation” of its human rights obligations, and the General Assembly and other UN bodies have called on North Korea to lift these restrictions. Were North Korea to allow its citizens to exit and return freely, it would mark the end of the Kim family’s draconian controls over the population and a substantial change in the nature of the regime. Its doing so would also relieve China of the intense criticism it now faces internationally for forcibly returning North Koreans to their home country where they suffer extreme persecution. No. 9: Will North Korea introduce human rights education for its population and disseminate to schools, offices and institutions a Korean language text of the Universal Declaration of Human Rights and copies of the human rights treaties to which it has acceded? Were North Korea to begin to distribute the Declaration and other human rights agreements, and host training sessions in these documents, it would mark a major departure in its outlook, making known to its population the rights to which they are entitled. UN bodies should be insisting that North Korea disseminate international standards to which it has acceded. No. 10: Will North Korea allow food aid to reach the hungry and take steps to increase the health and nutritional status of its population? Since 2008, international aid agencies and NGOs have reported that because of enhanced monitoring their food aid has been reaching substantial numbers of hungry people, especially children, pregnant women and the elderly. But North Korean defectors have often contradicted this assessment, and diversions to the military and the elite have been reported. Nonetheless there does seem to be an evolution in North Korea’s position with regard to “the principle of ‘no access, no aid.’”  Its latest agreements with WFP and the European Union (2011) contain strong monitoring arrangements, and WFP reports that its food is reaching those for whom it is intended. Food provided by South Korean NGOs in 2011 also seems to be reaching intended beneficiaries. And in negotiations with the US this year, North Korea reportedly agreed to stringent monitoring arrangements for resumed food aid shipments. Food distribution, however, is only a part of the problem. The more fundamental question is whether there is a readiness to address the root causes of ongoing hunger and improve the deteriorating health of the population. Thus far, this has not been evident. North Korea dispatched economists on visits to outside countries, including the United States, prior to Kim Jong Il’s death. But there is no evidence that North Korea is moving toward changing its system of collectivized agriculture, lifting restrictions on markets, relying on exports to import more food, and allocating more resources in its budget for food and health care. China has been pressing for economic reforms, but Kim Jong Un has been busy visiting military installations and affirming a continuation of the ‘military first’ policy which gives priority to the army in the allocation of resources. In the health field, North Korea has been cooperating with international and private organizations, but according to the UN Special Rapporteur, the state has made “virtually no new investments” in health, water and sanitation since the early 1990s. Despite the growing role of currency in the North Korean economy, the songbun (or social stratification) system remains in force, serving to discriminate economically against poor people outside the politically favored class. As can be seen, North Korea’s human rights record offers little encouragement. Still, it cannot be ruled out that at some point, its new leaders may find it beneficial to distance themselves from the terrible excesses and cruelty of the Kim Jong Il regime in order to salvage its economy, gain support at home, improve its international image or reap the benefits of stronger ties with the international community. Disagreement may exist within the North Korean power structure about the future directions of the country. One way to test the intent and mettle of Kim Jong Un and his advisers is to examine their actions in light of the above criteria. Roberta Cohen is a Non-Resident Senior Fellow at the Brookings Institution specializing in human rights and humanitarian issues; a Senior Associate at the Institute for the Study of International Migration at Georgetown University; and Co-Chair of the the Board of Directors of the U.S. Committee for Human Rights in North Korea (HRNK). The opinions expressed by the author are solely her own. Find more articles by Roberta Cohen. Kim Kwang Jin, “After Kim Jong-Il: Can We Hope for Better Human Rights Protection?” Occasional Paper, Committee for Human Rights in North Korea, 2009, p. 15. Victor Cha, Statement at Center for Strategic and International Studies (CSIS), February 10, 2012; see also Chico Harlan, “In North Korea, role of foreign currency grows,” Washington Post, February 16, 2012. Greg Scarlatoiu, “The Magnanimous Comrade: Kim Jong-un’s Amnesty,” The Peninsula, Korea Economic Institute, January 18, 2012. “N.Korea: Purges ‘Ensure Kim Jong-un’s Succession,’” Chosun Ilbo, December 27, 2011. Recent developments in Burma are a good example; so too is the Arab spring. UN Commission on Human Rights Resolution 2003/10, April 16, 2003. For UN Technical Cooperation Programme, see http://www.ohchr.org/EN/Countries/Pages/TechnicalCooperationIndex.aspx. Statement of Louise Arbour, United Nations High Commissioner for Human Rights, to the Human Rights Council, June 23, 2006, http://www.unhchr.ch/huricane/huricane.nsf/view01/C3A84A03209F3989C1257196003797CD?opendocument; UN General Assembly, Report of the Secretary-General: Situation of human rights in the Democratic People’s Republic of Korea, A/66/343, September 7, 2011, para.40. UN General Assembly, Report of the Secretary-General: Situation of human rights in the Democratic People’s Republic of Korea, A/65/391, September 24, 2010, paras.2, 46, 86. UN General Assembly Resolution, A/66/462/Add.3, 2011, para.5(3). UN Human Rights Council, “Draft Report of the Working Group on the Universal Periodic Review: DPRK,” A/HRC/WG.6/6/L.12, December 9, 2009, para.48. North Korea ended its dialogue with the EU when in 2003 the EU introduced a resolution on North Korea into the UN. Discussions at the Conference on the United Nations High Commissioner for Human Rights: Conscience for the World, The Jacob Blaustein Institute for the Advancement of Human Rights, February 7-8, 2012. 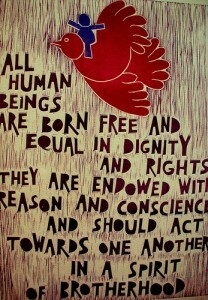 UN Commission on Human Rights, Resolution 2004/13, April 15, 2004. See, for example, “North Korea says UN rights talk is political plot,” The Malaysian Inquirer, October 23, 2010; and Note Verbale from the Permanent Mission of the DPRK to the President of the Human Rights Council, A/HRC/19/G/1, February 14, 2012. See Jeffrey Robinson, “Sun sets on Indonesia’s North Korea ties,” Asia Times, September 15, 2010. Report of the Special Rapporteur on the Situation of Human Rights in the DPRK, Vitit Muntarbhorn, to the Commission on Human Rights, E/CN.4/2005, January 10, 2005, para.10. Report of the Special Rapporteur on the Situation of Human Rights in the DPRK, Marzuki Darusman, to the General Assembly, A/66/322, August 24, 2011, para.55. Human Rights Council, Draft Report of the Working Group on the UPR, paras.90-92. “Human Rights Council adopts outcomes of Universal Periodic Review on Bhutan, Dominica and DPRK,” March 18, 2010, http://www2.reliefweb.int/rw/rwb.nsf/db900sid/VVOS-83PLC5?OpenDocument. UN General Assembly Resolution, UN Doc. A/66/462/Add.3, 2011, para.1(c). See Report of UN Secretary-General, 2011, para.28. Ibid., paras. 33-35; and A/HRC/17/28/Add.1. Report of the Special Rapporteur on the Situation of human rights in the DPRK, Vitit Muntarbhorn, to the Human Rights Council, A/HRC/10/18, February 24, 2009, para.3; Choe Sang-Hun, “New Constitution Reinforces Kim Jong-il’s Hold on Power,” New York Times, September 29, 2009. See Report of the Special Rapporteur on the Situation of Human Tights in the DPRK, Marzuki Darusman, to the Human Rights Council, A/HRC/19/65, February 13, 2012, paras.36-37. Such amnesties are generally announced around holidays or birthdays of North Korean leaders; in 2008, an amnesty was announced in commemoration of the sixtieth anniversary of the founding of the Republic. Goodfriends reports the release of some female prisoners who had been sentenced for border crossing. See North Korea Today, No 443, February 2012. This information, however, has not been confirmed. The amnesty in 2008 did not include those convicted for border-crossing. See Report of UN Special Rapporteur Darusman, 2012, para.40. Other reports have tied prisoner releases to bribes, see Lee Seok Young, “Defectors Facing Amnesty Payment Calls,” Daily NK, March 14, 2012. David Hawk, “The Hidden Gulag,” 2d edition, Committee for Human Rights in North Korea, April 2012 (forthcoming). See, for example, the human rights case reports prepared by the Database Center for North Korean Human Rights (NKDB), Seoul, www.nkdb.org, and the lists prepared by Free the North Korean Gulag (NKGulag). See Scarlatoiu, “The Magnanimous Comrade”; and Steven Lee Myers, “Clinton Says U.S. Will Relax Some Restrictions on Myanmar,” New York Times, December 2, 2011. Report of UN Special Rapporteur Darusman, 2011, para.60. “2010 Human Rights Report: DPRK,” US Department of State, April 8, 2011, http://www.state.gov/j/drl/rls/hrrpt/2010/eap/154388.htm. Hawk, “Hidden Gulag,” 2d edition; “What HRNK Stands for: Ten Practical and Specific Measures for Advancing Human Rights in United States Policy toward North Korea,” Committee for Human Rights in North Korea, May 20, 2010, Nos. 1 & 5. See Yoshi Yamamoto, “Taken! North Korea’s Criminal Abduction of Citizens of Other Countries,” Committee for Human Rights in North Korea, 2011, pp. 93-95. Ibid., pp. 9-37; “Panel confirms 55 citizens abducted by N Korea,” Korea Herald, August 2, 2011. UN General Assembly resolutions regularly call upon North Korea to resolve the abduction issue, see A/66/462/Add.3, para.2 (2011 resolution); governments such as Japan and the Republic of Korea have called upon North Korea to return abductees while US Presidents have met with the families of those abducted. Yamamoto, “Taken,” pp. 91-2, 95, 97, 119-120. Ibid. ; “S.Korea creates task force on kidnap victims,” Yonhap, December 26, 2011. Hawk, “Hidden Gulag,” 2d edition. Report of UN Secretary-General, 2010, para.19. UN General Assembly Resolution, A/66/462/Add.3, para1a (ii and iii), 2011; Roberta Cohen, “Legal Grounds for Protection of North Korean Refugees,” Life and Human Rights in North Korea, Citizens’ Alliance, Vol. 57, Fall 2010, pp. 9-14. See, for example, the US Congressional Hearing on China’s Forced Repatriation of North Korean Refugees, Congressional-Executive Commission on China, March 5, 2012, http://www.cecc.gov/pages/hearings/general/hearing5/index.php. See, for example, Dorothy Stuehmke, LATimes.com, April 21, 2011; Nancy Lindborg, Statement before Senate Foreign Relations Committee, June 11, 2009; and Jeff Baron on food aid, The Nelson Report, March 7, 2011. See Chosun Ilbo article in The Nelson Report, March 7, 2011. UN Human Rights Council, Draft Report of the Working Group on the UPR, para.48. The agreement includes 24 hours advance notice of visits, Korean speaking monitors, nutritional measurements of children. Report of UN Secretary-General, 2011, para.11. Statement of Allan Jury, World Food Program, at Center for Strategic and International Studies, February 10, 2012. See “S. Korea says food aid reached intended beneficiaries in N. Korea,” Yonhap, November 30, 2011; although North Korea recently announced it would restrict monitoring by South Korean NGOs. See “N.Korea said to reject S. Korean food aid with strings attached,” Yonhap, March 12, 2012. See “N.Korea to Allow More Monitoring of Food Aid Distribution,” Chosun Ilbo, March 15, 2012. “The Crumbling State of Health Care in North Korea, Amnesty International, July 15, 2010. See, for example, Stephen Haggard and Alex Melton, Peterson Institute for International Economics Witness to Transformation blog, January 18, 2012. See for example Randall Ireson, “Developing the DPRK Through Agriculture,” 38 North, February 8, 2012, https://www.38north.org/2012/02/rireson020812/. Report of Special Rapporteur Darusman, 2011, para.36. See “Marked for Life: Songbun, North Korea’s Social Classification System,” Committee for Human Rights in North Korea, 2012 (forthcoming); and “The Crumbling State of Health Care,” Amnesty International.